Crispy Pork Belly Roll ~ I Can Do That! 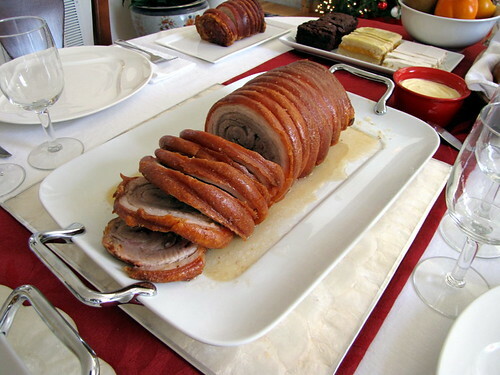 We didn't have ham for our 2011 Christmas dinner; we had roasted pork belly roll with its glistening golden crispy skin. I changed our usual Christmas menu when I saw JMom's crispy skin pork shoulder and I adapted her recipe together with the one from Serious Eats. Slow roasting made the meat juicy and tender and the high heat during the last 40 minutes made the skin crispylicious. This pork roll is finger-lickin' good and doesn't need any sauce. Place cut kitchen twine on a large baking sheet 1 inch apart. Wash and dry belly thoroughly with paper towels. Score the meat side half an inch deep in a crisscross pattern 1 inch apart. Mix 1¼ tablespoons salt, minced garlic, black pepper, red pepper flakes, and rosemary, and rub the meat side all over. Form into a roll and place on top of the twine. Tie the roll beginning from the outside. Mix the remaining salt and baking powder; rub all over the skin. Leave in refrigerator uncovered for 1 up to 3 days to dry out the skin. On the day of roasting, preheat oven to 400° F. Place pork roll on a rack in a roasting pan. Roast for 10 minutes; lower heat to 300° F and roast for 2 hours and 15 minutes. Increase heat to 500° F and roast for another 40 minutes. Remove from oven, tent with foil, and let the pork roll rest for 15 minutes before slicing. Check out more Christmas food from Kulinarya Cooking Club members. Wow! I can just sniff the delish aroma & feel the crisp skin crackling! Sarap! Thanks for sharing. Must try this one. Happy Holidays! Oh my goodnes...it looks absolutely crispy-licious! I saw this on your christmas table in fb and I was wondering if you were going to share the recipe. Thank you for sharing Oggi and a blessed Christmas and a propsperous new year to you and your family!